Happy Saturday Everyone! Hope you're having a fantastic weekend. Today I’m thrilled to be part of the Gratitude Giveaways Hop sponsored by I Am A Reader, Not A Writer and BookHounds I always love this giveaway hop because it is an opportunity to say thank you to all you wonderful followers. I so appreciate that you follow our blog and the friendships I've developed with many of you. This year I'm making this giveaway simple. 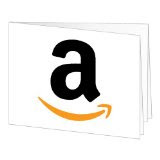 I'm offering a $10 Amazon Gift Card to one lucky winner to purchase a gift for someone else or themselves. 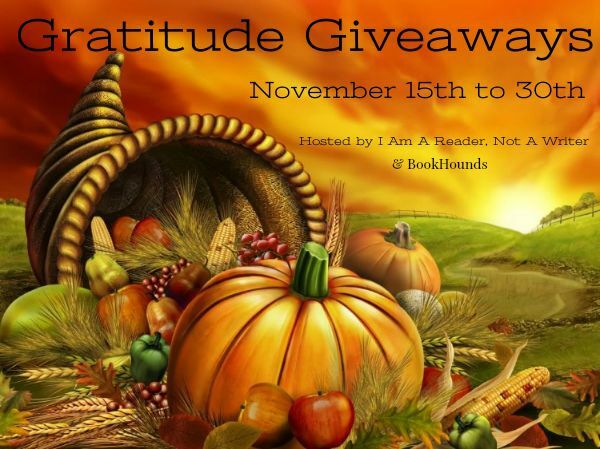 To enter, all you need to do is be a follower however you choose and leave a comment through November 30th. If your e-mail is not on your Google Profile, you must leave it in the comments. You must be 13 or older to enter. International entries are welcome. Next Monday I have a guest post by author Laura Wolfe and a giveaway of her YA ghost story TRAIL OF SECRETS. The Monday after that I have a guest post by Kim Briggs and a giveaway of her NA thriller AND THEN HE. Hope you have a nice weekend Natalie! You have my gratitude! Following you at rsbrandt44 (at) hotmail (dot) com. Thanks for the giveaway! :) I love your blog, Natalie! I always learn something, whether it's an interview or a guest post. I follow every way possible, I think. I love these hops. Thanks for participating. What a lovely giveaway! I follow via email. While you're thanking us, I also want to extend my gratitude for you and the interesting books you bring to our attention. So thank you! Thank you for the giveaway and your awesome blog! Email subscriber -- kayla3194 at gmail dot com. Thanks for all your wonderful blog posts and giveaways. Have a great week. Thank you for the giveaway. I follow by email, because I donèt do social media. I follow you on Bloglovin! Thank you. Thank you for the giveaway and the blog! You always have such wonderful posts. You also have my gratitude for running this awesome blog. Thank you for taking the time to share all that you do with us. I appreciate it. I am following by email. Thanks! I am a follower on Bloglovin' with the name morwesong. Thank you! And I am grateful for my wonderful blogging friends too! Terrific giveaway - hope you had a good weekend. I am unsure if my post posted. I will try again. If for some reason both go through, please disregard this one. I love this hop every year! You have the most amazing giveaways, Natalie. Thanks for all that you do for us writers, by bringing amazing books and author interviews for us. Awesome giveaway. Hope you're well Natalie! Following on Google Friend Connect as Michelle. email follower and in thankful for my family!thanks! I follow via GFC (Michelle). Bloglovin - https://www.bloglovin.com/people/suz-3102225. Thanks for this amazing giveaway - I would love to win! I follow by gfc as robyn donnelly. I follow by email,thank you! I follow as GFC (JourneysofTheZoo). I'm following on GFC as Pixel Berry Pie Designs. Thanks! I'm following on twitter - @leannenannette. Thanks for the giveaway! I follow via bloglovin-Texas Book Lover. i follow on GFC. thanks for the giveaway! my email is in my blogger profile. I follow via GFC and Bloglovin as Makaela.